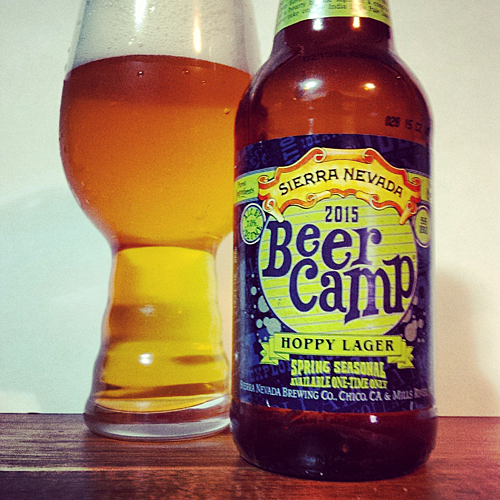 Sierra Nevada 2015 Beer Camp Hoppy Lager: Brewed in Chico, CA, this beer is a re-imagined version of the 2014 Beer Camp collaboration with Ballast Point. It was released as a spring seasonal, but this time with 55 IBUs (with completely different hops) with only 7% abv versus last year’s which was a bit stronger and had a higher IBU. This bottle was opened about three weeks fresh from the bottle date! Aroma and Appearance: It pours a clear golden honey colour with three fingers of foam and a fairly low level of carbonation. The aroma has lots of cereal grains and floral notes with some hints of lemon, tangerine and pine. Flavour: Lots of cereal grains up front and floral hops which quickly transition into fresh juicy tangerine, and citrus hit with a herbal crispy bite right in the middle of the beer. It finishes with a light grapefruit citrus note and lots of lingering pine resin bitterness that were very satisfying. Overall Impression: Honestly, i thought it was pretty darn good beer and was better balanced than the 2014 collaboration version with the new hop profile. Rating: I gave it an excellent rating of 8/10, worthy of a 6 pack pick up and it makes a great spring beer. Food Pairing: Go with a slightly spicy Mexican style taco of some sort for a great pairing here, the crisp lager mouth feel and fruity bitter hops will kick up the flavour and cleanse your palate at the same time. It looks like they’ll release a different homage to Beer Camp from time to time, probably because it’s good marketing, and it looks like they’ll do another Beer Camp in the summer of 2015. Anyway here’s a video contest posted on their Facebook account where a video submission could get a trip out there which would be cool.